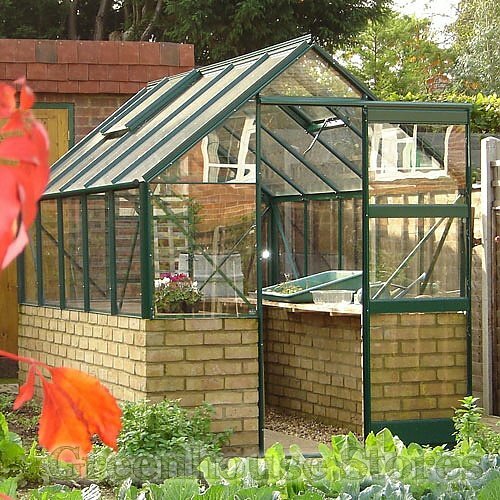 1912m (6ft 3") Wide Aluminium Greenhouse - Ideal Width for most gardens. Low Threshold Base - Groung level entry point. High Roof of 7ft 7" - Plenty of Headroom. High Eaves of 4ft 10" - Good growing height. Single Sliding Door - 2ft 11" Wide Entry. 3 Opening Roof Vents - Allowing hot air to escape for Ventilation. 10 Year Warranty - Covers aluminium frame. The 6ft x 16ft Elite Dwarf Wall greenhouse with it’s 6ft 3" width and 5ft high eaves is designed with traditional looks in mind. These traditional greenhouse looks are achieved using high quality aluminium with non of the maintenance worries associated with a wooden dwarf wall structure. The Dwarf Wall 6x16 Greenhouse benefits from a sturdy high quality aluminium frame with bracing and strengthening throughout. The double sliding doors have an integral door catch to keep the door shut in high winds or open when you need more ventilation. New features for 2013 include a door handle and a proper key lock for security. It features the Elite Low Threshold Base giving a safe and practical entry for you and all of your gardening bits and bobs. Elite toughened safety glass gives you peace of mind where children and pets are present and safety is top of the list. Toughened glass simply granulates if broken removing any danger of injury from shards of glass. 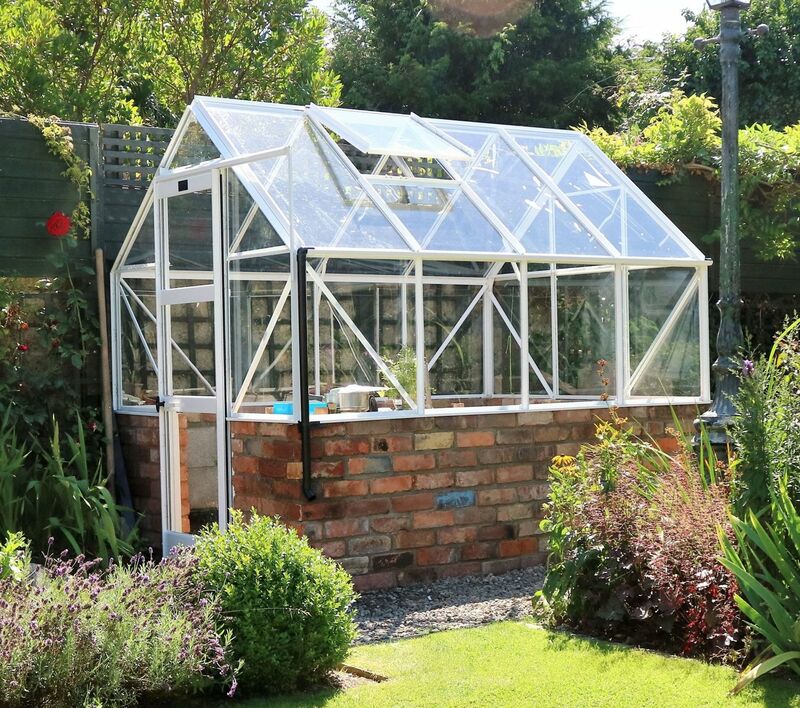 This Elite Dwarf Wall Greenhouse 6 x 16 has 3 opening roof vents for ventilation, a single sliding door with key lock and integral gutters to collect rain water. When constructing a wall please only build your brick base once you have an official Elite base plan from Greenhouse Stores. Please note the required wall height is 762mm. Bricks used should be a completely good standard solid engineered brick without holes. This 5 slat aluminium staging gives you a useful waist height work and storage surface down 1 side of your greenhouse. This 5 slat aluminium staging gives you a useful waist height work and storage surface down both sides of your greenhouse.